White River Source ships seeds generally to any destination worldwide. We ship plants only to destinations within the USA. If you have placed an order for a destination that we cannot reach, we will refund and cancel the order. Shipping and handling charges that are added to your order at the time of check-out are generally good for most of the world destinations; however our automatic shipping calculator has limitations. We will let you know by email if there is a change, and give you the opportunity to accept the change or cancel. Allow time for your order to be delivered based on the posted delivery schedule on the catalog pages. These posted schedules may change seasonally, so be sure to check this at the time of placing your order. Please notify us immediately of any problem that you have with our shipments. Our goal is to completely satisfy every White River Source customer. Please send comments to service@whiteriversource.com We need to hear from you. Misshipped products will be either refunded or replaced, at our discretion. The product must be returned, so email for instructions. Please contact us before returning any item. Shipper damage should be reported to the shipper at time of delivery. Also immediately send an email to us. Do not send pictures unless we ask for them. When the shipper takes responsibility for such, we may replace the product or refund your payment at our discretion. Any items that were properly shipped can not be returned. There is no refund on properly shipped items. Our seeds are tested and our plants are alive at the time of shipping. There is no further warranty. If there will be a delay in shipping an item, or you have ordered early for seasonal items, you will receive an email with the expected shipping schedule. If you have received one of these emails and have opted to keep your order standing, we will ship as soon as we can. Cancellations can be made by email at a future date, but cannot stop orders in the queue for shipping, (for example: trees that have been pulled from ground, or items that have been packaged for shipment) Your backorders could be shipped out for up to 10 days (in US, longer outside US) after you have attempted to cancel a backorder. If you have placed your order by post, you will not receive these automatic schedule change notices unless you have given us an email address. Send an email separately upon checkout to tell us if you wish no substitutions; however we can often provide very similar varieties or the next size plant without delaying your order or backordering items. If the next size smaller plant is substituted your account balance will be adjusted. Larger sizes will not be charged without your prior approval, we will send an email. In the event of crop failure, product damage, or other supply problem, White River Source reserves the right, at our sole discretion, to substitute similar product, hold order until next available ship date, or refund money. All payments for agricultural products made to White River Source are taken as a contract to produce, or for booking of product from planned inventories and production that is to be shipped at the Earliest Available Ship Date as is the standard in this industry. All queries regarding shipping schedules should be directed to shipdept@whiteriversource.com and you should understand that this will be our best estimate and is subject to change without notice. If you would like to receive your product after a particular date, please send an email, referencing your transaction #, and your schedule request. We will do our best to meet your schedule, however orders can not be contingent on any particular shipping schedule. Our knowledge of planting seasons and new seed lot supplies may be used to make shipment scheduling judgments such as holding orders for new lots that will be available. Customers with special schedule needs should send email to allow shipment of untested, marked Substandard or last year's stock, etc. White River Source generally does not take returns on seeds or plants. 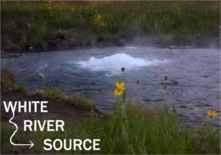 White River Source must authorize any returns. There are no refunds for shipping and handling on any shipments not accepted or undeliverable and these orders are subject to a 15% restocking charge. There are no refunds for any item that was special order or specially grown for the order. There is a service fee of $40.00 for payments made to White River Source that are bounced, returned, or unfunded for any reason; such an event can also be cause for delay of shipping time on other future orders. If this is your first time ordering from us, please read our Help/FAQ section here linked which is incorporated in these terms of sale. White River Source, at it's sole discretion, may refuse or cancel any order, but usually it's because someone hasn't read the terms. We are proud of the quality service and products that we offer. And we hope that you will tell your friends about us too. ENJOY!